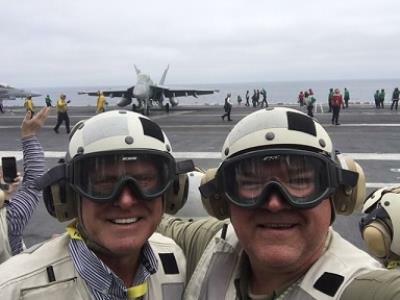 Dr. Jason Rehm and Dr. Woody Kennedy of the Plastic Surgery Group recently returned from a visit to the US Navy Carrier USS Stennis (CVN74) off the coast of San Diego. The two were chosen to participate in the Navy’s “Leaders to Sea” program. The program is designed for people who are active and influential in their communities and are active communicators and opinion leaders. Those selected are presidents or chief executive officers, healthcare leaders, government officials, news media owners/ publishers and leaders of significant, broad-based organizations who have had no prior exposure to Naval surface operations. Both Dr, Rehm and Dr, Kennedy played a role in Chattanooga’s Navy Week earlier this summer when Rear Admiral Paul Pearigen visited the Plastic Surgery Group. Rear Admiral Pearigen is the chief of the Navy Medical Corps and commander, Navy Medicine West. During a visit with the entire Plastic Surgery Group, discussions ensued about the trauma surgical procedures done by Naval surgeons and shared interests and expertise with the Group. The two departed Chattanooga for San Diego where they boarded a Grumman C-2 Greyhound called a COD (Carrier onboard Delivery) aircraft that flew them several hundred miles off the coast. 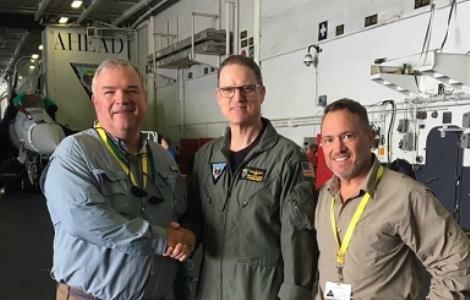 They were joined by Governor Butch Otter of Idaho on the visit and landed on the deck of the Stennis as the aircraft completed a tail-hook landing. Once on board the carrier, the two noted the sheer size of the vessel and how the floating city operates around the clock. Under the leadership of Admiral Michael A. Wettlaufer, the John C. Stennis Strike Group synchronizes up to 10 ships and 70 aircraft. It is prepared to sustain air operations to maritime interdiction. While the majority of the crew is made up of 20-somethings, many of the exercises and activities in which they participate go back decades. The practices encourage team work, proficiency, organization and a knowledge of the important role each sailor plays. Dr. Rehm said, “While the technology aboard is second-to-none, we were impressed with how many aboard rely on practices used throughout the years.” One such example is that of the Air Boss. Located in the tower above the flight deck is a board with a model of each aircraft moved around it throughout the day and night. The Air Boss knows which aircraft needs fuel, which ones may need tires and other information. As he navigates through his 18-hour day, the Air Boss is constantly in communication with the ship’s commander, pilots and deck crew to ensure each plane is ready to deploy at a moment’s notice. Staying in officers’ quarters, the two thought the evening would be relatively quiet; however, Navy training lasts well into the night and begins long before the sun comes up. The steam-driven catapults that launch departing planes off the deck are always running as are the wires allowing planes to land in a controlled crash orchestrated by the Air Boss.